Built in 1986 to commemorate Chiba Prefecture's population reaching the 5 million people mark, the Chiba Tower is 137 meters tall. It overlooks the port in Chiba Bay and gives visitors beautiful panoramic views. 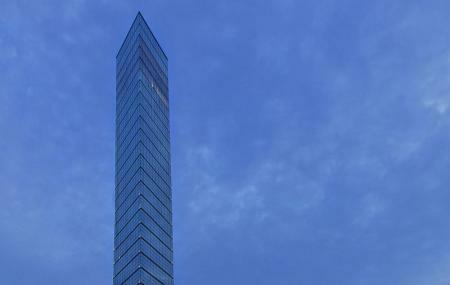 An architecturally stunning building, behind its mirrored glass exterior, the tower has only four floors! There is the ground floor and then directly the top three floors. The middle portion of the body of the tower is hollow! The top (4th) floor is an observatory. The third floor has a restaurant called Café La Plage. An eatery at 109 meters up in the air! An experience to be had in Chiba. The second floor is another observatory, but it is called ‘Lover's Sanctuary’. The floor is only for couples, with seats set together in close pairs near the windows. It also has a place to pray for matters of the heart. Visitors can buy heart-shaped locks and, after writing their and their loved one's names on it, fasten it onto a window grate for all to see. The ground floor houses the souvenir shop and an information deck. Cafe and ice cream parlour present within the tower. How popular is Chiba Port Tower? People normally club together Inage Ocean Park and Yamato No Yu while planning their visit to Chiba Port Tower. Pretty great view of Chiba and the surrounding areas. Mt. Fuji can be seen off in the distance on a clear day. It only cost a few bucks to head to the observation deck which is nice. The tower is just a short walk from the train station. Friendly staff and amazing view from the top. Has a small waterfront area to sit by and relax. If you took the monorail to get here, save your ticket because I think you can get a discount. Best to go on a clear day, but I still enjoyed the views on a cloudy day. I thought the 430 yen was worth the trip up to see Chiba Curry and Port from 113 meters up. Low-key sightseeing spot in the middle of a large park. Family friendly.